On a dark and dreary night the last thing any driver wants to do is pull over at the side of a narrow road or fast moving motorway to change a tyre. Until now the alternative for most people has been to wait for breakdown assistance which has its own disadvantages such as time delays incurred and the dangers associated with waiting in precarious locations. 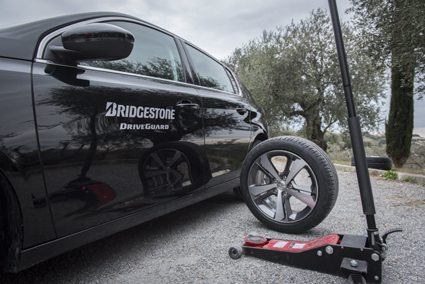 Bridgestone launched their new “DriveGuard” tyres in Monaco this week and claim that their run-flat design will ensure safer driving and allow motorists to continue on their journey following virtually all types of tyre damage. While run-flat tyres may have been on the market for a number of years these have always been car specific and designed in conjunction with manufacturers with no common specification across the range. What’s unique about the Bridgestone DriveGuard tyre is that it can be fitted to any vehicle which has a Tyre Pressure Monitoring System (TPMS). This will allow drivers of any make or model of car to experience the safety and convenience of run-flat tyres. With 60% of people having experienced a puncture in the past 4 years Bridgestone DriveGuard tyres will allow you to drive up to 80km at 80kmph so that you can reach your destination or at least get to a safe place where you can pull in to change a tyre or wait for assistance. So how does it work? The tyres consist of a supporting rubber compound and optimised gauge which are designed to support the car’s weight under sudden air loss. The belt material has also been strengthened and stiffened and cooling fins reduce heat build-up from friction at low pressure to improve durability and ensure the tyre won’t degrade for at least 80km. The mountain roads just outside of Nice were the test site for this launch and we drove two identical Peugeot 308s, one fitted with Bridgestone’s bestselling Turanza T001 tyres and the other fitted with DriveGuard tyres to experience the difference, if any, between the two. On the road the Turanza was slightly softer with a little more comfort, however the DriveGuard tyre produced less road noise and although it was a little firmer on the road it did feel like a sportier tyre. The second on-road test began with a nail being driven into the sidewall of the Bridgestone DriveGuard tyre which was fitted to a Renault Megane SW. Once the front tyre had been completely deflated the car was taken out onto the mountain roads. 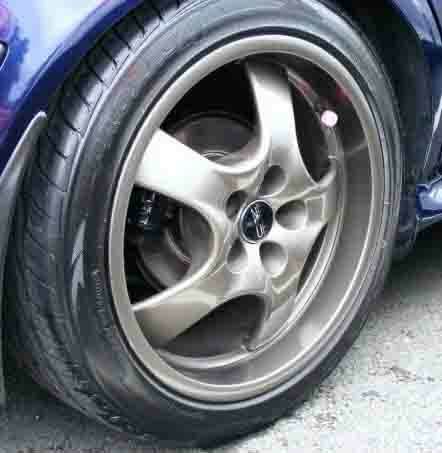 Despite there being noticeable noise from the tyre when in motion and slightly heavier steering the car was still able to tackle bends and bumps and most significantly was safe to drive. If the Tyre Pressure Warning is ignored or not functioning correctly the tyre has been designed to slowly degrade with increased vibration and noise to warn a driver that’s something is wrong rather than suffering from a sudden complete failure. With 23% of punctures occurring after dark and 50% in an inconvenient location Bridgestone’s DriveGuard tyres aim to provide peace of mind to drivers by allowing for the retrofitting of run-flats to any car. However it’s not all about the convenience and safety aspects. The DriveGuard summer tyres have achieved an A rating for wet grip and a B rating applies to winter tyres in the European tyre labelling system. They also achieved a respectable C rating for rolling road resistance. As Bridgestone predict that the availability of run-flat tyres for the majority of cars will negate the need to carry the extra weight of a spare wheel DriveGuard is also contributing to a driver’s eco credentials and not to mention the dreaded puncture repair kit.